Oppo, the Chinese phone maker will be launching today its new flagship device at an event in Beijing. 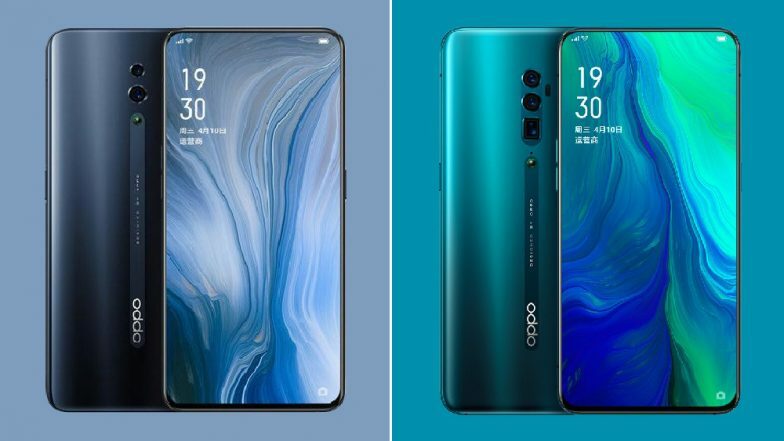 To be called as Oppo Reno, the new smartphone is likely to be offered in two versions - Standard & 10X Zoom version. The event is expected to be limited to China market and the company might unveil the device globally on April 24 in Zurich, Switzerland. The Oppo Reno 10X Zoom will be employing company's 10X optical zoom technology that was unveiled at MWC 2019 earlier this year. The launch event is scheduled to start from 2PM CST (approximately 11:30 AM IST). Oppo Reno Smartphone's AnTuTu Listing Reveals Key Specifications Before Launch; To Come With Snapdragon 710 SoC & 6GB RAM. The launch event of Oppo Reno will be live streamed on the official website. It is important to note that the streaming will be made available first for the registered users followed by the general public at 6PM CST (around 3:30 PM IST). The Chinese phone maker has been teasing the smartphone for quite some time now. We already know that the new Reno smartphone will be offered in two variants - Standard edition and 10X Zoom edition. The standard variant will be powered by Qualcomm's Snapdragon 710 SoC whereas the 10X zoom variant will be equipped with Qualcomm's flagship chipset - Snapdragon 855. The phone will be offered on four exciting colours - Extreme Night Black, Fog Sea Green, Mist Powder (Gold), and Nebula Purple. The chipset on the phone will be mated with up to 8GB of RAM and 256GB of internal memory. There are speculations in the market that the RAM and internal storage configuration will include - 6GB of RAM + 128GB internal storage, 6GB RAM + 256GB internal storage and 8GB RAM + 256 internal storage. The company also has been teasing VOOC 3.0 fast charging technology and NFC connectivity. Oppo's Upcoming Reno Phone Hides Selfie Camera in Wedge Slider. The Oppo Reno 10x Zoom Edition will come with 48MP high resolution Sony IMX586 sensor with f/1.7 aperture along with an 8MP ultra wide-angle lens, and a 13MP telephoto lens. The phone also comes with dual OIS technology. The phone reportedly will sport an AMOLED display with TUV Rheinland certified for low blue light levels. The notchless display will provide screen-to-body ratio of 93.1 percent. As the phone will feature no notch, a pop-up camera is likely to take care of selfies, however there is no official confirmation about the same. Several leaks previously hinted that Reno 10X Zoom edition will get 8GB of RAM, 256GB internal space, ColorOS 6.0. It is also rumoured that there will be an in-display fingerprint sensor. As far as the prices are concerned, the phone is likely to be priced somewhere in between VND 14,000,000 and VND 15,000,000 in Vietnam which is approximately Rs 41,300 to Rs 44,000.